With Mother's Day around the corner, I decided to post a recipe ahead of time in order to give you space for a test run. 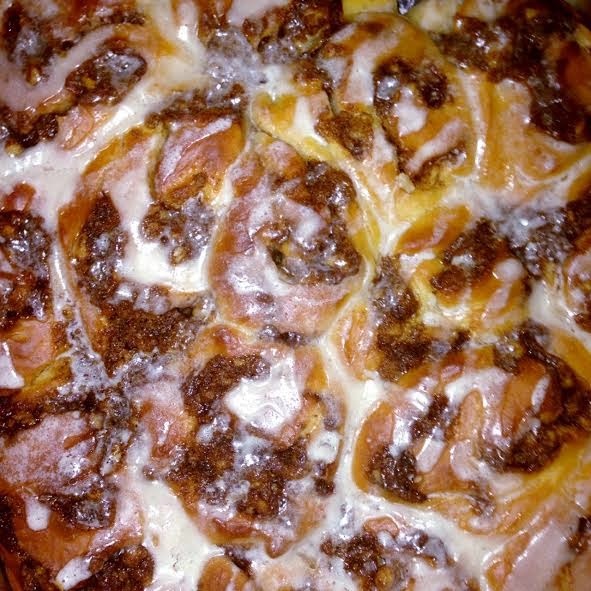 Once you try this recipe you will realize those awesome cinnamon rolls you rarely encounter can come out of your kitchen! They aren't that hard - really! But they do take some time. My advice start these after lunch on a leisurely Saturday afternoon and enjoy with your coffee on Sunday. The lucky ones that get to try your results will most likely hail you as supreme baker. Your best best is to make these for mom or, better yet, mom-in-law and guarantee you place in the favorites category. * This recipe yields approx 25 rolls depending on size. I would recommend a Kitchen Aid or similar mixer with a dough hook and a brush for working with the filling. In a saucepan, over low heat, stir milk and vegetable shortening until it melts and let cool. In a large bowl whisk, for about five minutes, warm water, 2 tbs of sugar and yeast until the yeast has dissolved. Add the milk and shortening mixture to the yeast mixture in the large bowl. Now add the remaining 1/2 cup of sugar, the eggs and salt to our main bowl and stir until well mixed. Switch your mixer from a whisk to a dough hook and add the flour. Place dough in a lightly oiled bowl - I just add EVOO to a paper towel to coat the bowl and the dash a bit on my hands to lightly coat the dough once placed in the oiled bowl. rolls out of baking pan! Cover bowl with aluminum foil and refrigerate for at least 12 hours up to 24 hrs. Butter pans of your choice - I used a deep rectangle pan but for giving away I suggest 9 inch round pans. Make filling by mixing 1/2 stick room temp butter, 1 cup brown sugar, 2 tbs cinnamon and chopped walnuts creating a crumbly mix. (for extra buttery sweet rolls up filling mix by 1/2 more). On floured surface - roll out dough into a rectangle shape - if you roll too thin the bread will end up crunchier and thicker yields breadier rolls. Melt 1/2 stick butter and brush on to rolled out dough. Sprinkle filling mix throughout rolled out dough. Roll up the dough from long side to long side as tightly as possible, pinching at seems when joined. Place in cool oven (unheated) to rise for at least 30 minutes. Place in middle rack and bake for 25 to 30 minutes at 350. While rolls bake pull out your mixer and begin to prepare glaze by sifting confectioners sugar and salt into mixer bowl. Slowly add melted butter, vanilla and almond milk to mixer bowl, continuing to whisk steadily for a few minutes. As soon as you remove baked rolls from oven flip over onto cookie sheet, releasing from baking pans. Flip rolls bottom sides down and glaze on serving dish. 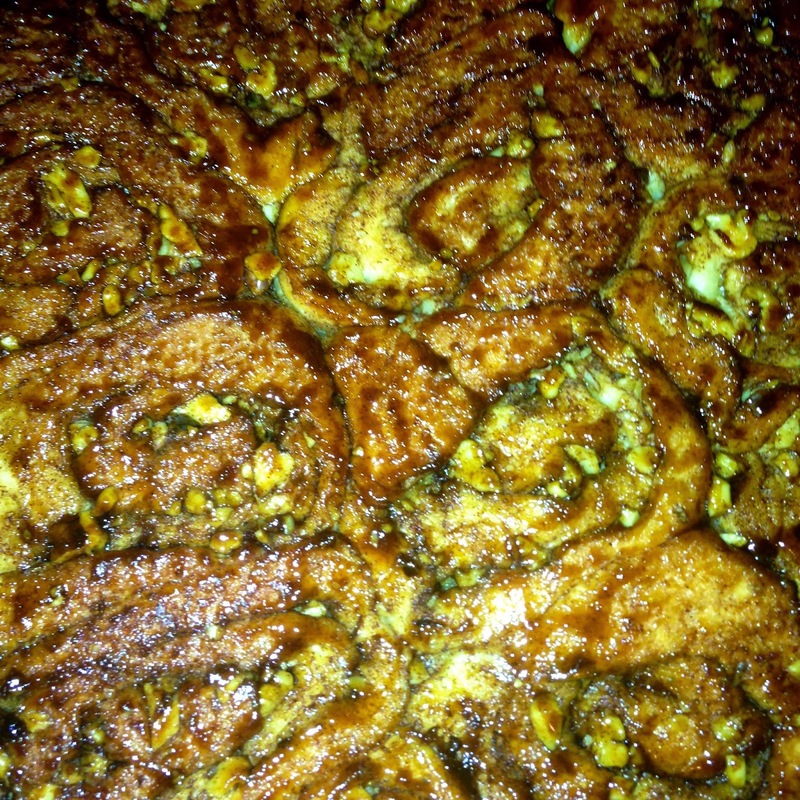 Recipe modified from Joy of Cooking Overnight Rolls & Williams-Sonoma Overnight Cinnamon Rolls recipes.